Panasonic started the year strong with the release of the 65-inch EZ1002 back in January, and now it's keeping that form going with a 77-inch upgrade to the HDR-supporting OLED TV alongside another new 4K ready model, the EZ952, that will unlock your home viewing experience like never before. 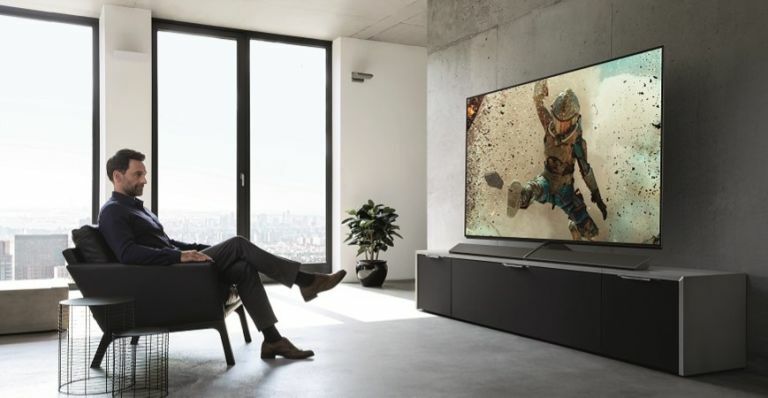 Panasonic has always championed the idea of recreating films exactly as the filmmaker intended, and with both models supporting Panasonic’s new cutting-edge Studio Colour HCX2 processor and its 4K Pro HDR status, you'll experience some of the most accurate colours, deep blacks and details ever seen on a home TV. To deliver the very best audio quality, the EZ1002’s ‘Dynamic Blade Speaker’ has additionally been tuned by the engineers from Panasonic's own Technics brand, creating a far richer in-built audio offering. Meanwhile, the EZ952 offers exceptional audio from its powerful speakers, with a contemporary pedestal stand built with a stylish interior design feel in mind. The 65-inch EZ1002, 65-inch and 55-inch EZ952 will be available in the UK from June 2017, while the 77-inch EZ1002 will hit stores in the autumn. D-Link has just launched its very first Apple Homekit-enabled cam, the Omna 180 Cam HD, and it's bundling 180 degree wide eye lens, Full HD 1080p resolution, motion detection, two-way audio and night vision all into one package under £200. The Omna 180 Cam HD's 180-degree setup and de-warping technology means you can maintain a vast view of your home with a clear picture to match, two-way audio and a motion detection system that will automatically record if tripped. The new Omna 180 Cam HD is available for purchase online today via Apple for £199.95. When it comes to an active lifestyle, you need to have a pair of headphones you can rely on. That's where the great AH-C16W Wireless In-Ear Sports headphones from Denon come in, offering a design that's lightweight, wireless, rugged and robust in sound. Its special Earhook design will keep it snugly over your ear without pinching, while a set of silicone tips will ensure you find the right bud for your lugholes. Those tips are treated to make them anti-sweat, while the AH-C160W's internal components are anti-moisture to ensure they don't degrade with all that sweaty use. The AH-C160W even has simple multilingual voice prompts to simplify set-up and use, as well as reporting on your battery level to make sure you're never caught out by a depleting power source. Add in its lightweight feel and high-quality 11.5mm drivers and you've got one great fitness-minded set of headphones. The Denon AH-C160W is available now for £149 in black, blue and white. You can order a pair today from Audio Visual Online and other Denon retailers. Jaybird, one of the first to bring wireless sports buds to the world, has announced the Jaybird X3 Wireless Sport Headphones will finally be available to customers in the UK. The X3's don't require a headphone jack (making them ideal for the future of the iPhone), instead using Bluetooth 4.1 to keep your connected to your fitness playlist at all times. They're sweat-proof so they won't slip out of your ears mid set and with eight hours of use on a single charge, even the hardiest of ultra marathon runners won't run out of juice anytime soon. The Jaybird X3 Wireless Sport Headphones will be available shortly for a price of £109.99 from the likes of Dixons Travel and John Lewis. If you're a Nest user, or you're in the market for a new upgrade to your home security setup, you'll be pleased to learn the Nest experience is getting a bit of tune up via the handy Nest app. Available for iOS and Android, the Nest app will now enable you to receive a live video feed if nearby carbon monoxide levels get too high. Nest is also making it much easier to access your video history for easy browsing. You can even drag and drop features onto your Android 'desktop' so you can stay connected in fewer taps. Finally, Nest is introducing automatic door detection for the Nest Cam range (which forms part of Nest Aware subscription). With all these fine tuned features, the Nest range is becoming more essential than ever.